Solitudo is located on the north side of Dubrovnik. There are 21 mobile homes and 300 pitches for touring units, all with 10-16A electricity and 30 with water, arranged on four large fields that are opened according to demand. Field D is mainly used for tents and pitches here are small. Field A has pitches of up to 120 sq.m. and takes many motorhomes (long leads required) and from some pitches here there are beautiful views of the mountains and the impressive Dr. Franjo Tudman Bridge. All pitches are numbered, some are on terraces and most are shaded by a variety of mature trees. The ground is hard and stony (firm tent pegs needed). There is a shop for essentials plus the affiliated hotel complex 1 km. down the road which provides bars, restaurants, tennis courts, sports fields and a shopping centre. 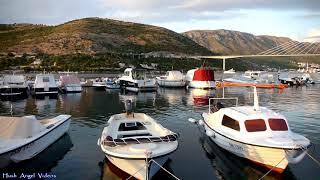 The location is excellent, just a few kilometres from the historic old town of Dubrovnik. It also has a beach which makes it an ideal base for both sightseeing and relaxing. Two attractively decorated, clean and modern sanitary blocks have British style toilets, open washbasins and controllable, hot showers. Good facilities for disabled visitors. Laundry. Motorhome services. Shop. Attached restaurant/bar. Snack bar. Tennis. Minigolf. Fishing. Bicycle hire. Beach with pedalo, beach chair, kayak and jet ski hire. Excursions organised to the Elafiti Islands. WiFi (free). From Split follow no. 8 road south towards Dubrovnik. Site is very well signed, starting 110 km. before reaching Dubrovnik, and throughout the city.